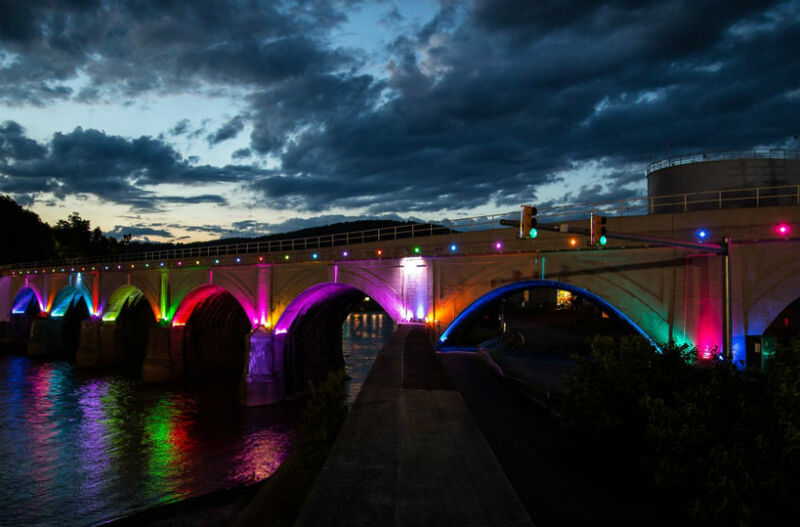 The Johnstown Area Heritage Association lights the bridge for holidays as well as public events and community observances, such as health awareness events. Major health awareness observances such as Breast Cancer Awareness Month are generally on our calendar. But because there are hundreds of similar observances, JAHA welcomes suggestions of lighting occasions that are important to members of the community, and accommodate when we can. The lights are also available for rent for private events such as memorials, birthdays, pregnancy gender reveals, sports events, wedding anniversaries, and other occasions! Multiple color combinations, animations, and effects are possible. The fee for this service is $100 per evening, with additional evenings for $50. Please note that JAHA reserves the right to refuse requests due to conflicts or other reasons. Requests and rentals must be made at least a week in advance, but a month in advance is preferred. To suggest a community event or observance, or to inquire about a private rental, please use the form below.